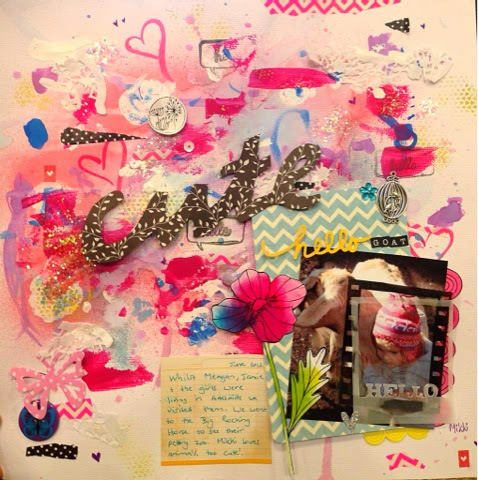 Tonight I was inspired by Scrapbooking Memories Magazines call for 'Not my style' submissions this month and decided to have a go at a very messy mixed media style page. I have attempted some recently but this time I actually used paper I had used as a backdrop when painting some words so it was very messy! Paint, watercolours, stamps, doodling, gesso, mists, glitter, inks, you name it I threw it on this background! All things considered I'm pretty happy with how it turned out but I think I'll go back to a slightly more simplistic style next time!